According to a domestic manufacturer of full-sized trucks, 1 in 4 pickups sold today are heavy-duty models. That ought to serve the producer in question—General Motors—quite well, considering that it makes 2 of the 4 brands on the market, and its Chevrolet Silverado and GMC Sierra HDs have been redone, as 2015 models, with new exterior styling, interiors, and features. Though still on the same core heavy-duty platforms that date to the 2011 models, both brands’ three-quarter-ton 2500 and 1-ton 3500 trucks are adopting many of the elements that bowed in the 2014 half-ton Silverado and Sierra 1500s. They include a stronger and more versatile cargo-box design with two-tier loading capability, integrated tie-downs, available under-rail LED lighting, “CornerStep” rear bumper, and “EZ Lift-and-Lower” tailgate, the last standard on all but the entry-level Silverado Work Trucks and base Sierras. Silverado HD enjoys a bolder looking grille for 2015. A 2500-series crew cab in LTZ trim is shown here. Interiors have picked up the 1500s’ shared instrument-panel design, which incorporates the display for the latest-generation Chevrolet MyLink/GMC Intellilink infotainment systems that are standard equipment on all but the low-line models from both brands. Come September, the HD trucks will be available with Wi-Fi hot-spot connectivity through OnStar’s new 4G LTE network, which should be a boon to getting work done at remote job sites. Other new technical features of note include an integrated cruise-control, automatic-grade-braking, and—on diesel-powered versions—exhaust-braking system to help make towing easier. The GM trucks can do a bit more hauling, too, considering that maximum payload and towing limits have been raised. Also, the StabiliTrak antiskid system with Trailer Sway Control is standard on all HD models. Silverado 2500/3500 trucks come in Work Truck, LT, and LTZ trim levels, while Sierras are available in base, SLE, SLT, and distinctively appointed Denali forms. 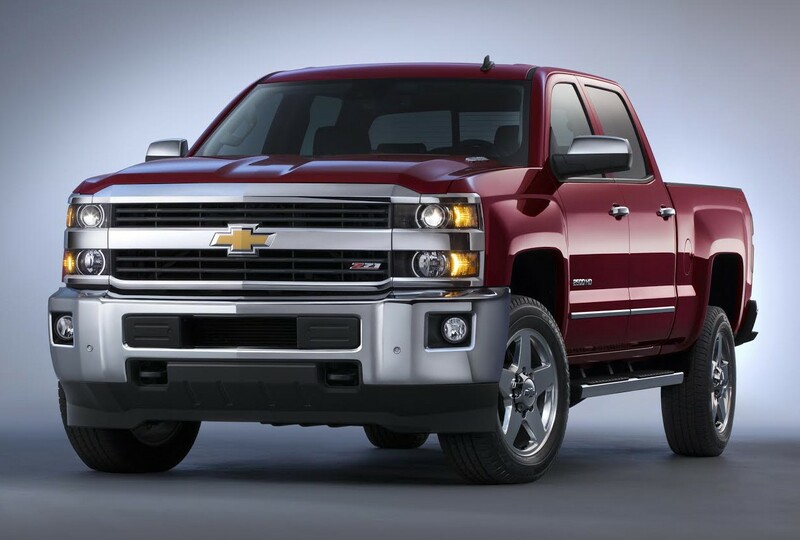 (Chevrolet does not offer the Silverado 1500’s premium High Country trim in the HD lines.) Depending on trim level, regular, “double,” and crew cabs available. The double cab, which replaces the former extended cab, has independently opening front-hinged doors designed to improve access in tight parking spaces. Meanwhile, crew-cab rear doors are larger. Depending on the cab/bed combination, the heavy-duties ride a variety of wheelbases from 133.6 to 167.7 inches. All configurations come in a choice of 2- or 4-wheel drive, and all 3500s can be equipped with dual-rear-wheel axles. Both brands sport new exterior styling with big marque-specific grilles. The new front end is designed to deliver more efficient airflow to the cooling system and engine air intake. As usual, GMC Denalis stand out with a unique mesh grille design and body-color bumpers. A freshened cabin is part of the HD update for 2015. Shown here is a Sierra in Denali trim. Cabs are stronger, with nearly two-thirds of their structures made from high-strength steel. New inlaid doors fit into the bodysides rather than wrapping over the roof and combine with new triple door seals to reduce wind noise. New sculpted front seat backs contribute to a gain of approximately two inches of rear leg room in crew-cab models. Storage spaces include upper and lower glove boxes, now standard in all trim lines. Rear-seat cup holders have been moved from the back of the floor console to the rear doors, creating a new storage area for rear-seat passengers. 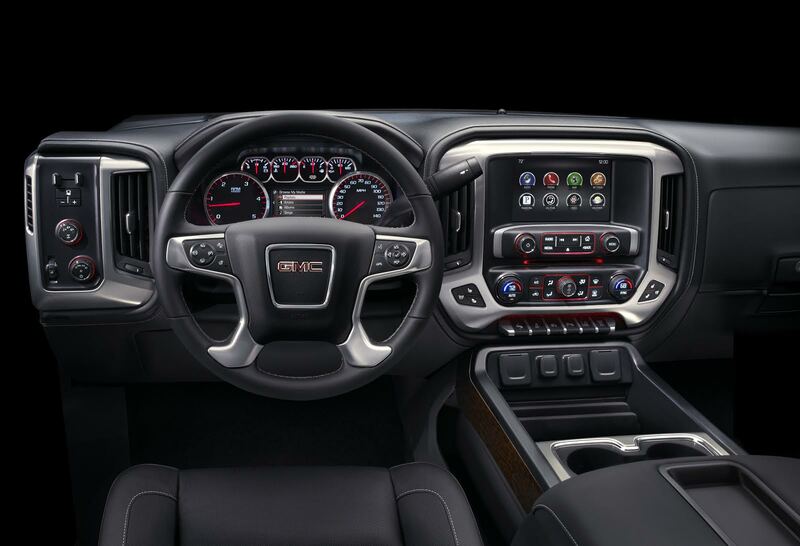 Most Chevy and GMC heavy-duties share the six-dial instrument cluster introduced for the 2014 1500s, but the Denali sports an electronic customizable information display where others have physical gauges. Cargo-bed floors are constructed of roll-formed steel that the manufacturers claim mixes strength with light weight. A factory-provided spray-on bedliner is a new option for GM’s heavy-duty pickups. Powertrains have been carried over from prior years. The standard engine is a 6.0-liter flexible-fuel V8 with continuously variable valve timing. It is rated at 360 horsepower and 380 pound-feet of torque. It is joined to a 6-speed Hydra-Matic automatic transmission. Optional is a 6.6-liter turbodiesel V8 rated at 397 horsepower and 765 pound-feet. Its power is channeled through an Allison 1000 6-speed. Diesel-equipped trucks do come with a new electric-assist heater designed to speed up cab warming. Also essentially unchanged is the suspension: front short-long arm with torsion bars and rear multistage parallel-leaf-spring. There are five different front gross axle weight ratings. Still, payload and towing capabilities have been raised. In 3500s, maximum available payload is 7374 pounds (up from 7222 pounds) and maximum available conventional towing capacity with the available factory hitch is 19,600 pounds (up from 18,000 pounds), both segment-leading figures. Fifth-wheel towing now tops out at 23,200 pounds, an increase of 700 pounds. 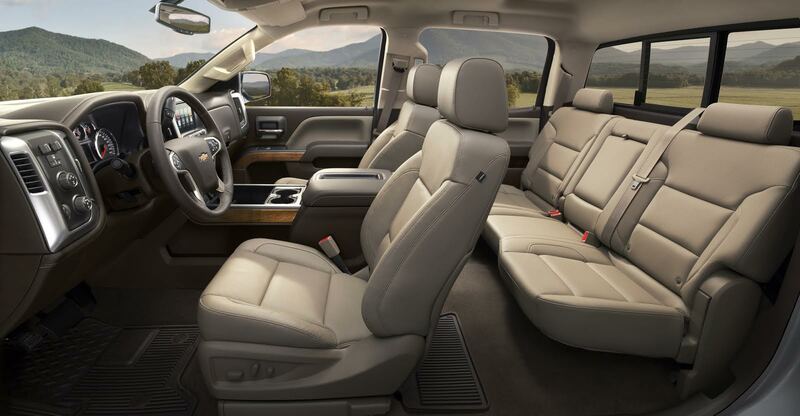 Stepping into the Silverado HD or Sierra HD can be a chore, but once there passengers will find the cabin a pretty nice place to be. Shown here a Silverado in LTZ trim. Seventeen-inch wheels are standard on 2500HD and 3500HD, with 18- and 20-inch wheels available on 2500HD and 18-inch wheels available on 3500HD. All models are available with all-season or all-terrain tires. Our chance to drive the new Chevy and GMC HDs at a press preview in Arizona showed them to be pleasingly quiet on the highway for the most part. In diesel-powered examples, you had to almost consciously listen for engine clatter when accelerating on the highway. Big towing mirrors generated some wind noise and a scoured road surface made the tires sing a bit, but that toned down drastically on smooth surfaces. High-end models we tested—including a diesel 3500 Denali “dually” that topped $67,000 with options and delivery—were as luxurious as they were stout, with woodgrain highlights and plenty of soft-touch surfaces. Oh, and lots of room. Step-in height is considerable, so save some scratch for cab steps if one of these trucks is going to double as a family car. Steering is boosted well enough for ease with a sense of control, but rigs this big will never be anything close to nimble, so parking takes a little planning. The diesel exhaust-braking system was impressive in a three-way comparison with diesel-powered Ram and Ford heavy-duties, each pulling a trailer with 10,000 pounds on it. On a stretch of highway in a hilly area north of Phoenix, a Silverado 2500 did the best job of holding its preset speed on downgrades. Meanwhile, in side-by-side acceleration, the Chevy was able to pull away from the Ram and Ford. Anyone with serious towing needs will want to dig deep for the $8395 it costs to acquire the Duramax diesel (and requisite Allison transmission). For grunt, it has a clear advantage over the standard gas V8. A gas-engine Silverado LT that we drove included the Z71 off-road option that includes an effective hill-descent control that can be engaged to operate at very low speeds—though it’s somewhat “gravelly” in sound and feel when operating. 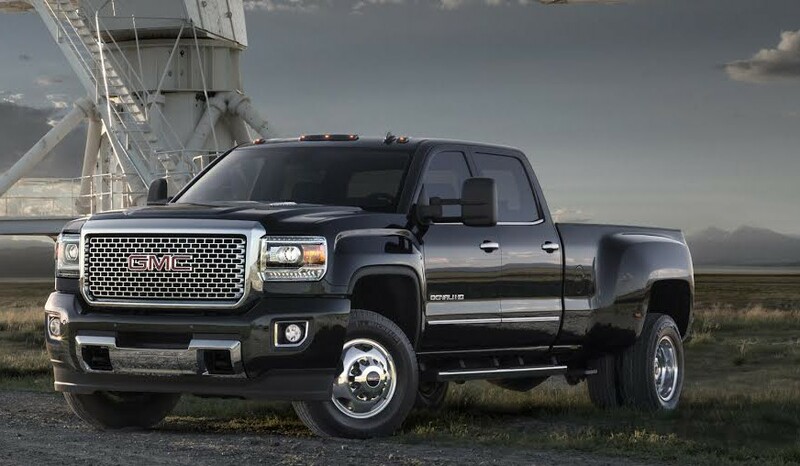 The Chevrolet and GMC heavy-duties come with a 3-year/36,000-mile limited new-vehicle warranty and a 5-year/100,000-mile limited warranty on powertrains. There is also 2-year/24,000-mile coverage for scheduled maintenance, including replenishment of diesel exhaust fluid. Written by: John Biel on February 5, 2014.on February 25, 2019.